We’re switching things up today. 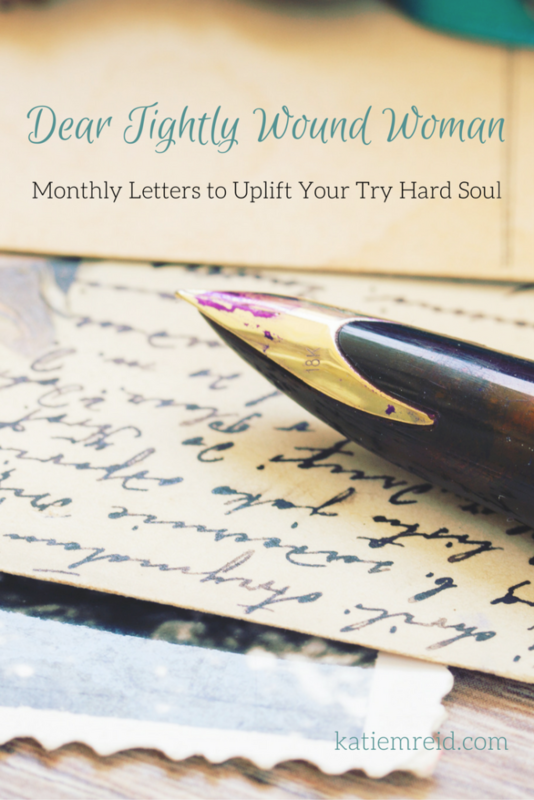 Instead of reading this month’s letter to the Tightly Wound Woman, how about you take a listen? Email subscribers can listen here. I know a secret that you carry…you don’t like feeling foolish. You fear what others think of you, of what they whisper behind your back, or behind closed doors. You don’t like to make mistakes. You often try to calculate all the factors and act in a way that minimizes criticism. You aim to be flawless because the fault-finders stir you up, spin you around, and leave you off-balance; feeling out of control. And, dear tightly wound woman, you do not like feeling out of control. You feel lost when you aren’t sure what the expectations are, so you strive to exceed them, so it won’t hurt so much. Can I let you in on a secret of mine? What I say goes. And I sing love songs over you. I declare My affections in waves of grace, in lush pathways, and in morning light. I stamp My seal of approval upon your heart in the crimson red of My blood poured out for you. Let them call you foolish because, guess what? I use the foolish things to shame the wise (see 1 Corinthians 1:27). As you use your hand prints, your footprints, your heart beats, and your brain waves to know me and make me known, you are waltzing with wisdom. You often tire yourself out because you are striving to earn My approval or trying to repay Me a debt that you owe. Daughter, I delight in you and wisdom belongs to Me—an adorned beauty, at-the-ready, to instruct you. You do not have to dance alone. Simply ask and I will provide wisdom beyond measure. I give you Myself, My full attention, and My expert instruction. Keep in step with My Spirit. Let Me gently guide you along the way. Don’t assume what the next step is. We may take it slow or sit down for a rest. We may do a two-step, a side-step, or a quick-step. As you keep pace with Me the pressure on your shoulders will lighten as you learn the freedom found in following Me—your capable and accomplished Partner. In Me is true wisdom. You may feel like a fool as you stumble ungracefully, but, My grace, My perfection, will hold you. I have chosen you. I have invited you here for this particular dance. I am enthralled with your beauty. The light of My Son and His affections for you make you shine. Breathe in My wisdom as you lay down your insecurities. Let me lovingly lead as we waltz together. Read the rest of the Letters to the Tightly Wound Woman. Or listen to some of them. So beautiful! It is so good to hear this reminder from God. Thanks for sharing sweet friend. Blessed to be your neighbor at the RaRa linkup this week. Yes, this is me! Reminding myself daily that God is in control, and waltz in wisdom!